NVIDIA and MathWorks have collaborated to deliver the power of GPU computing for MATLAB users. Available with the latest release of MATLAB, NVIDIA GPU acceleration enables faster results for users of the Parallel Computing Toolbox and MATLAB Distributed Computing Server. Parallel Computing Toolbox and MATLAB Distributed Computing Server enabled users to access the power of GPU computing with just a few changes to existing MATLAB code. 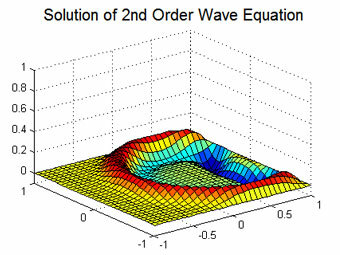 It also enables users to call CUDA kernels directly from MATLAB. The innovative technical development by MathWorks leverages NVIDIA's feature-rich CUDA computing toolkit, helping to allow MathWorks to bring the benefits of GPU computing to the MATLAB community. MATLAB users can now easily enjoy the benefits of GPU computing from within MATLAB, without C/C++ or FORTRAN programming. 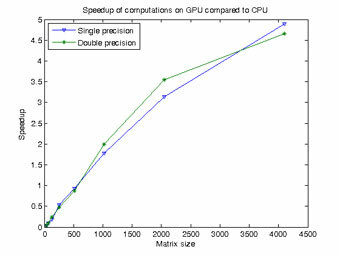 The powerful GPU computing capabilities in MATLAB were developed on Tesla and Quadro GPU computing products and require the use of recent CUDA-capable NVIDIA GPUs, such as NVIDIA Tesla 10-series or 20-series products supporting compute capability of 1.3 or above (learn more).